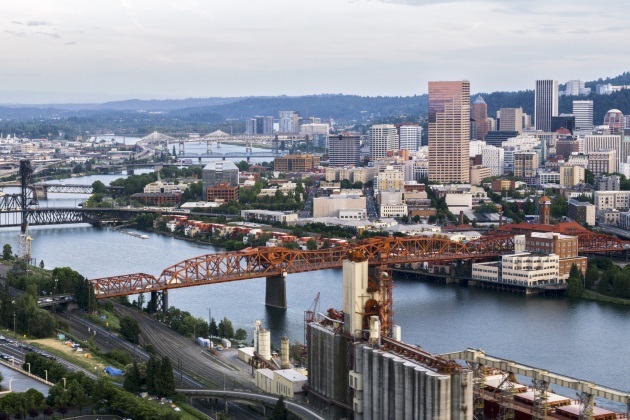 MultiBrief: Portland, Oregon’s Urban Growth Boundary: Smart growth or a stranglehold on the city? Portland, Oregon’s Urban Growth Boundary: Smart growth or a stranglehold on the city? When it is not being sent up for its bike karaoke and ironic moustaches, Portland, Oregon, is being held up as the city that threw out the rule book for conventional city growth patterns in the U.S. It is distinctly more walkable, bike-able and compact than other cities in the country and has become the poster child of "smart growth" in the U.S. Some of that is down to a not particularly glamorous land use policy introduced in the 1970s that essentially drew a circle around the city to stop sprawl in its tracks, and to reflect development back toward the downtown area. But the policy has been divisive — it has also been accused of playing a key role in contributing to Portland’s ongoing affordability crisis. We have a look here at how it came to be, and what its effects have been. It is not only Portland that has such a boundary. All of the cities in the state of Oregon have something similar. The strategy has been copied by other cities too — notably there is similar legislation in Washington and Tennessee. Oregon’s own experience began in the 1970s, when Gov. Tom McCall introduced land use restrictions designed to protect the farmland surrounding the state’s cities by heavily restricting construction, and encouraging the use and re-use of more central land. This might seem like an unlikely strategy amid the anti-regulatory political climate of the U.S. However, sub-regional plans in cities like Portland can have quite some force. It is designed as a positive spatial planning approach — not one focused on restrictions but about channeling development inwards and encouraging it to concentrate in more central parts of the city. That helps to provide the "critical mass" of people in these districts to justify public transit provision, and gives a boost to walkability and active travel. This is one of a suite of plans that has made Portland look so different from other cities in the U.S. — the light rail, the bike-friendliness, the people-friendliness, the blooming of green infrastructure. It is managed through a system that cooperates with private developers to bring forward projects in Urban Renewal Areas and negotiate over densities. It makes a lot of sense. So what is the opposition all about? One key criticism of these boundaries is that a city can only densify so much before things become tough. When buildable land is made scarce, it tends to drive up the price of housing— basic demand and supply. The rush to build affordable units in Portland over the last couple of years has tried to cool down these price rises, but they continue to shoot up. This reflects the so-called "green noose" argument against land-use boundaries. However it should be noted that others do not see the policy as the problem, explaining the rises as a natural outcome of increasing desirability of place. One of the major problems caused by ribbon development and urban sprawl is how it performs on sustainability criteria. Low-density suburbs are notoriously difficult to serve by public transport, because they simply can’t reach the critical mass. If an urban growth boundary is not kept up-to-date and is outgrown, this might cause leapfrog development, where development “leaps” over the no-build areas to land precisely in these highly unsustainable locations with long (usually car-based) commutes into the center. Nobody wants that. Unlike the U.K.’s earlier version of the policy (the "green belt," which was established in the 1930s and said to inspire the UGB), Portland’s growth boundary is not defined legally by its permanence. This allows it to be adjusted regularly to ensure there is enough developable land to supply a growing population. Indeed, every six years an Urban Growth Report forecasts population and employment growth and adjusts the boundary to meet that forecast. The boundary has regularly expanded since its creation. This prevents the UGB becoming a nostalgic fetish, and allows it to address the challenges of today. Of course these expansions themselves are controversial. In December, Oregon’s metropolitan authority approved four new expansions, totaling 2,200 acres of development. This was the first expansion since 2014 and the largest since 2002, reflecting the growth pressures on the city. The next assessment is due in 2024. Bringing land forward to build on is always crucial to housing a growing population, but to make that growth sustainable it has to happen in the right places. It is also a path littered with emotions and opposition. There are serious cultural barriers to overcome — as much as architects and urbanists berate them, Americans love them. One complaint is that now in Portland only the wealthy can afford a backyard — while Europeans bring their children up in apartments and use public open space, the American dream lies behind your own front door. The example set by Portland — a city that seems at its best to provide density with a high quality of life and green space — is an important one. But maintaining diversity and serving those at the lower end of the economic spectrum will require careful management if the city wants to rise above its satirical "Portlandia" portrait. Lucy is a UK-based urban and environmental planner, with a background in Open Data policy and energy policy. She is fascinated by how we grow our cities and towns, and how we can learn from place, as well as how apparently dull policy details can transform the experience of our everyday built and natural environment. She writes here about urban spaces in the U.S. and beyond from all kinds of perspective — from the busker to the policy maker.